Have you ever made a cake in a microwave? I knew of a girl at university who made them a few times as we didn't have ovens in our student halls, but I had never tried it myself. Until recently when my boyfriend wanted dessert after dinner, I hadn't made anything and didn't particularly want to spend long making a pudding, but I didn't want him to just get a bar of chocolate from the cupboard. So I had a look online for some microwave chocolate cake recipes and as usual put my own spin on it by adding some pieces of a Terry's chocolate orange that I happened to have in the cupboard. You need a large, sturdy microwave-safe mug (i.e. with no gold trim!) to make this. You can mix the ingredients in the mug; it is easier to do it in a bowl but to me half the fun of this was making the entire thing in one mug. Mix the flour, sugar, cocoa powder then make a well in the centre and break in the egg. Mix in as smoothly as you can then add the oil and the milk. Insert two chocolate orange segments in the mug and push in. Microwave on high for three minutes - that's all it takes! You can either eat this straight from the mug or turn out (using a knife run around the sides) into a bowl. The chocolate orange melts on top and the rest of the mixture does actually turn into a cake! It's a bit on the stodgy side and certainly not the best cake I've ever had but for a dessert that you can make in less than five minutes from start to finish you can't complain! I'm sending this to Dead Easy Desserts, the blog challenge run by Maison Cupcake and hosted this month by Michelle at Utterly Scrummy. 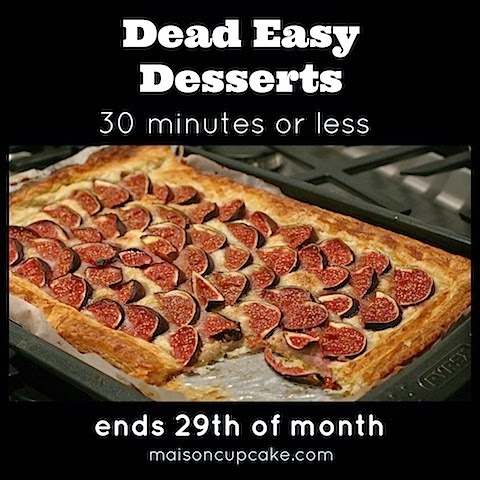 The idea is to send in desserts that take 30 minutes or less to make; I don't think you can get much faster than this! I've heard take of this microwave cake but never given it a go. Our london flat doesn't have a microwave as there's barely room for an oven bit I'll try it when we're next home. The cake looks quite like a steamed pudding which I know both myself and The Viking will love! I am yet to attempt my first mug cake but chocolate and orange is one of my flavour combinations so might coax me to do it! Thanks for sending to Dead Easy Desserts! Seen this post and many others on this site.